These super lightweight juggling scarves float for a slow, easy cascade. Using scarves is the fastest method for learning or teaching how to juggle three objects. Also used by many professionals for special performance techniques. Great for kids, schools, and teaching large groups. Woven nylon construction. 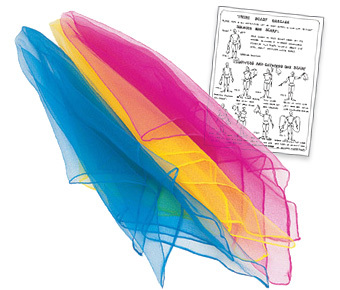 Juggling scarves are available in 3 neon fluorescent colors: pink, yellow, and blue. Instructions included. Click for complete description and specs. #2000 Juggling Scarf $3.25 ea. No DVDs or Books found. Learn juggling with the basic cascade pattern using 3 Dubé juggling scarves. Kyle will teach you a few extra tricks too! More juggling stuff on Kyle's website.